OK, because I want to join the linky party, here is my photo of Step 3 of Bonnie Hunter's "Easy Street." Not that you haven't already seen a dozen or more (60 linkups last I checked!) photos just like this! I'm posting a tutorial tomorrow for my method of making the shaded triangle block. 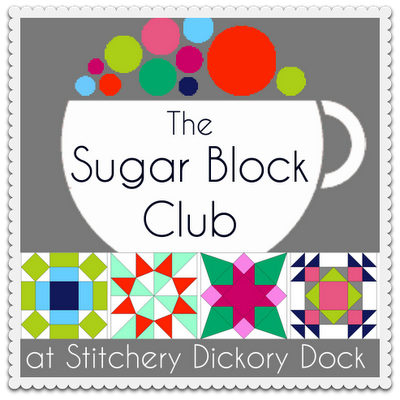 If you follow this blog, you know I'm giving away a free member ship in Stitchory Dickory Dock's "Sugar Block Club." For fun, I've asked people who comment to name their favorite quilt block. The Log Cabin block is in the lead, but several people have named blocks I didn't recognize! 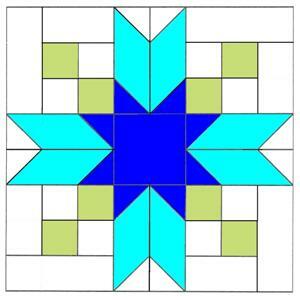 Craftsy has a paper-pieced pattern for this block available for download for only $3. Another block I'd never heard of is "Blackford's Beauty." I love this one -- precision piecing at its best! I found free instructions for this block at Quilt Lover's Guide. So what's your favorite quilt block? Go to this post and comment for a chance to win a membership in Amy's "Sugar Block Club." Wow, love that dresden heart! I love the eternity knot block. That is one I must try. I love log cabin blocks, they are so versatile. The purples and greens look great together - even if they are Flying geese blocks. Love that Eternity knot too and the heart dresden and the ... - well really - how can you pick just one block??? Your patches look fantastic. Clue 4 is nearly here – woo hoo! Favourite block? That's tough because it changes - maybe Moth in the Window at the moment. Love the Dresden heart do you have a pattern to share. Joyce, the Dresden Heart is not my design. If you click on the name next to it, it will take you to her site. Did you realize you are a noreply commenter, so your comment went straight to the spam folder? Sorry I didn't respond earlier, I am just now clearing out my spam folder. However I am having issues with your RSS. I don't know why I cannot subscribe to it.